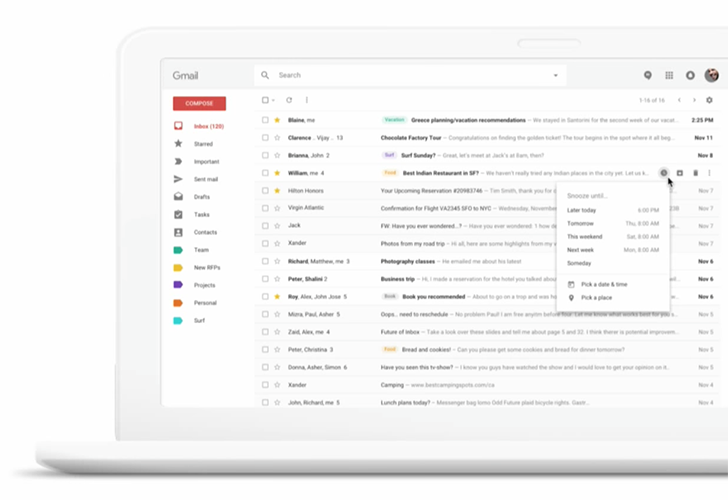 Google announced today to its G Suite customers that a “new design” is coming to the Gmail web interface, along with a bunch of new features. The update will first arrive as an Early Adopter Program (EAP) experience in the coming weeks, before rolling out to others. What will this new experience be like? Google didn’t share pictures, only that it will be “a fresh, clean look” for Gmail. It probably looks like this, though, which was first spotted back in September. But with the new design, you’ll have easier access to Calendar, ability to Smart Reply to emails (like you do in the Gmail app), the option to snooze emails and choose when they reappear (like in Inbox), as well as offline support. According to Google, the offline support will be native and arrive in June 2018. While this redesign info was shared with G Suite customers, you have to expect that everyone who uses Gmail will get this new experience. When, we don’t know, but the EAP starts for G Suite within the coming weeks. We’ll let you know when it’s ready.